We've talked about the intricacies of scaffolding in it's base and structure - how it's put together so it is safe and provides a standard. Today I'd like to think about it's purpose. Scaffolding is meant to be set up, yes, but it is designed to also be taken down. It's there for the building, but removed to reveal the building itself in all its glory. Your job, mama, is for a season. You are there to help your student to build their education, yes, but ultimately you must teach them to build their own scaffold in order to continue building on their own. Scaffolding is built to be torn away. It is impermanent. You will not always provide it. Before I get all maudlin, though, I want to think about why this is a wonderful thing. As a parent (A Christian parent in particular), your job is to raise a child into an adult: an adult who stands firmly on the Christ as a foundation; an adult who can take their rightful place in society; an adult who can fulfill their responsibilities and duties. "Train up a child in the way he should go; even when he is old he will not depart from it." Proverbs 22:6 We want to raise children who is a mature adult without our added every-day support. Our safe standard will be pulled away from their every day life. This is as it should be. I am not saying you have no place in your adult child's life - I'm very thankful for both Jason and my parents and their place in our lives and the lives of our children. There is a saying of King Alfred's that I like to apply to our School,--'I Have found a door,' he says. That is just what I hope your School is to you--a door opening into a great palace of art and knowledge in which there are many chambers all opening into gardens or field paths, forest or hills. One chamber, entered through a beautiful Gothic archway, is labelled Bible Knowledge, and there the Scholar finds goodness as well as knowledge, as indeed he does in many others of the fair chambers. You see that doorway with much curious lettering? History is within, and that is, I think, an especially delightful chamber. But it would take too long to investigate all these pleasant places and indeed you could label a good many of the doorways from the headings in your term's programme. But you will remember that the School is only a 'Door' to let you in to the goodly House of Knowledge, but I hope you will go in and out and live there all your lives--in one pleasant chamber and another; for the really rich people are they who have the entry to this goodly House, and who never let King Alfred's 'Door' rust on its hinges, no, not all through their lives, even when they are very old people. That beautiful House of Knowledge where there are nooks and crannies, corridors, secret passageways between galleries ... isn't that what we want for our children? For ourselves? We give them entree and a little help navigating it during their school days, but it is a place of delight for the whole life. They learn to wander and love the halls of that vast House under our care, but it soon becomes a place of exploration and where they desire to be. But nothing in Mrs. Franklin's metaphor seems to me to be aimless wandering. It is always purposeful. My children are approaching the last half of their education at home. It feels like a long way to go, but I see the short amount of time it really is. It is time for me to start to teach them to set up their own plans and scaffolds - oh, not the whole thing, but part of it anyway in these years. 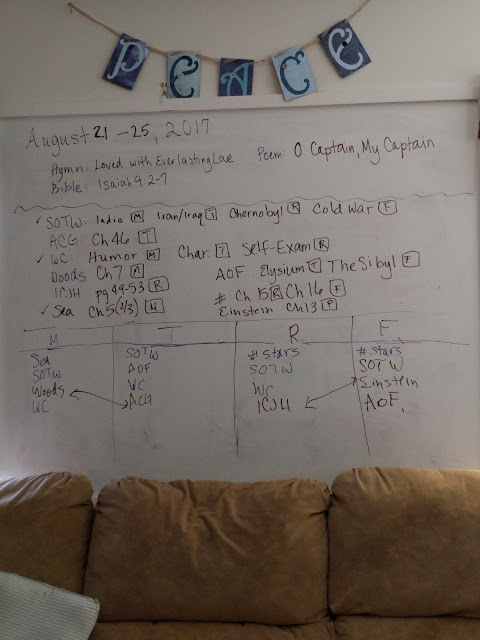 In my home where I teach habits of scholarship, help to train neural pathways, follow the shepherd by still waters, make assignments and requirements, I ought to be helping my students understand scaffolding so they can continue building in the way they should go. Working together to plan the week's assignments. This is from AO Y6, week 11. When we start a lesson with "What do you remember?" then pay attention, read, narrate, keep record of, then culminate with "What does this remind you of?" and a grand conversation; that's scaffolding. Perhaps they notice the pattern at a young age, perhaps they don't. In these upper grades, I want to make it more obvious. I want them to see how they appropriate knowledge and gain wisdom. I want them to see that the stability and structure are really becoming their responsibility. Teaching our students to connect a reading back to previous reading helps them in the habit of slow reading; of taking their time and allowing ideas to marinate before adding to them. It is restful learning. I look back to my University days and remember how I was expected to read and acquire the information necessary to pull together ideas for papers, essays, and exams. It wasn't handed to me on a platter. At Oxford - I did not go to Oxford - the students "Read" an area of study and then meet with a tutor to discuss what they've read. No multiple choice. No fill in the blank. Pull ideas from here and there and express them in a clear and organized discussion. This is what we're helping our students learn to do at young ages. We present information and talk about it. We're giving them the steps to succeed at pulling together and making connections to prior knowledge and to ask questions as they delve into deeper study. But it's hard. Children aren't regurgitating "the right answer" because we aren't looking for an answer in particular. They aren't filling out a worksheet but using their mind to incorporate readings into their context and representing it in words - whether written or oral. Narrating a complete passage or chapter is hard mental work. It takes practice and consistency and persistence. It's a skill that takes time to get good at. By noticing what is connected and what isn't in their narration and keeping, we leave room for questions for future, deeper study. What effect did so-and-so's choice have on the rest of the story? Should they have done such-and-such? What is at the bottom of the Marianas Trench? How do we know when and where an eclipse will happen? Why was the Treaty of Versailles a lead-in to the Second World War? Were the Spanish Civil War and McCarthyism connected? How? Why? Who showed bravery, love, service, virtue in this situation? How do I show those things? To take the highest things out of a curriculum is to attempt to win a temporary consensus by sacrificing what the education of a human being ultimately is for. We avoid religious questions at the cost of avoiding the most human questions. And thus education, which should be human, is reduced to the mechanical and the low. We are not imagining a castle in the air. We need only restore a very old and venerable thing in the world, with its foundation solidly laid in the God-created earth, and its spire pointing towards the place where man is meant to turn. I am coming to see that this is, perhaps, the most important part of what we are teaching our children to do. We are teaching them to learn on their own and to want to continue to do so. The information is important, yes, but not as important as learning to wield the tools of learning rightly. You can see how these practices should be taught and required, but I hope you can also see how a child should grow into ownership of them. 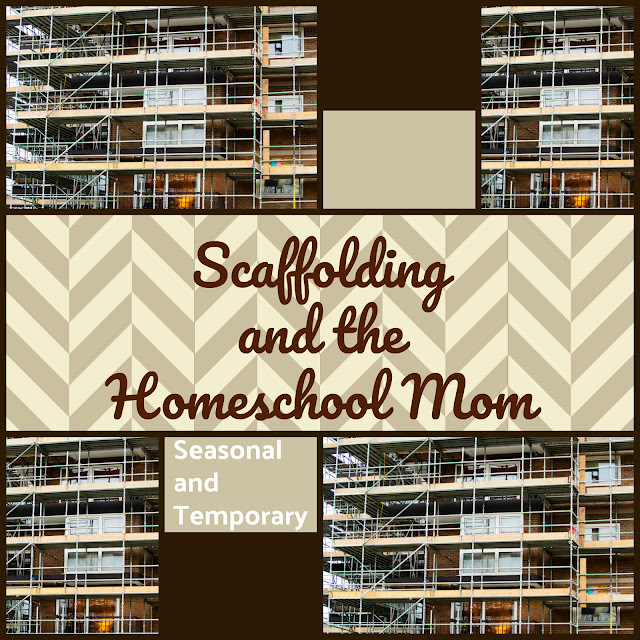 How scaffolding is a mother's responsibility for a season, how her support is temporary to a child, and he should learn to set up his own scaffolds in the future. This caught my eye as a homeschooler and wife of a scaffolder. Thanks for your wisdom, it was encouraging when i really needed it.